Dhaka, 14 May, Abnews: Ed Joyce and William Porterfield restored a measure of batting pride in Ireland’s inaugural Test with an unbroken opening partnership after the hosts were made to follow-on by Pakistan at Malahide on Sunday. 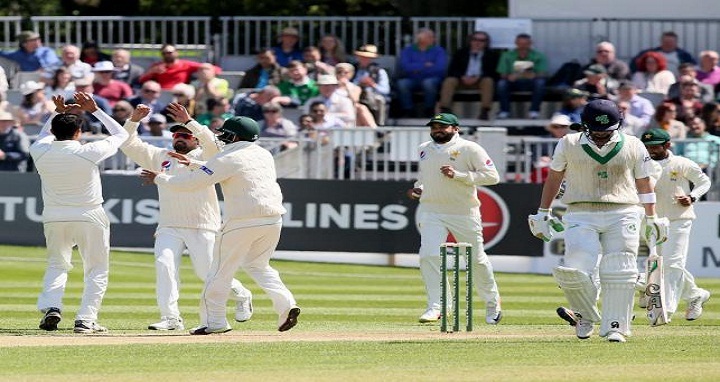 But come the third day’s close, Ireland remained in trouble at 64 without loss in their second innings-still 116 runs adrift of Pakistan’s 310 for nine declared after a meagre 130 all out first time around. But with Mick Jagger, a lifelong cricket fan, among the crowd-the Rolling Stones play a concert at Dublin’s Croke Park on Thursday-the openers gave Ireland some satisfaction in a day dominated by Pakistan. Joyce was on nought when he edged Amir to wicket-keeper Sarfraz Ahmed, with the diving Pakistan captain unable to cling on to the low chance. And Porterfield had made just three when Azhar Ali fumbled a routine catch at third slip. Amir left the field after sending 3.2 overs in Ireland’s second innings with a recurrence of a knee problem. “We’re (less than) 120 behind, we know we’re going to have to bat really well but I think the two lads showed at the end there that it’s definitely possible,” said Ireland’s Gary Wilson, who earlier made a gutsy 33 despite a possible fractured elbow suffered battting in the nets. “We can take a huge amount of confidence,” he added. Former England one-day international Joyce, at 39 the oldest Test debutant since Australia’s Bryce McGain made his bow aged 36 in 2009, cashed in with some elegant shots including a cover-driven four off Mohammad Abbas. The paceman took four wickets for 44 runs as Ireland’s first innings was wrapped up inside 48 overs. Abbas struck twice in a 30-minute spell before lunch to leave Ireland five for three after Sarfraz’s well-timed declaration. Ireland were in danger of marking their debut with the lowest completed innings total by any side in Test cricket’s 141-year history-New Zealand’s 26 against England at Auckland in 1955. But Kevin O’Brien’s belligerent 40 spared them that embarrassment on a day when more than 100 former Ireland internationals had gathered to celebrate the men’s side’s maiden Test. Wilson, who came in down the order, helped ensure South Africa’s 84 against England at Port Elizabeth in 1889 remained the lowest total by a side in their first Test-match innings. Former England one-day international Joyce, arguably Ireland’s greatest batsman, appeared to be a first-innings victim of the fact the Decision Review System was not being used in this Test because Cricket Ireland decided they could not afford the $50,000 cost. Teenage leg-spinner Shadab Khan continued his fine all-round display by taking two wickets in three balls to leave Ireland 61 for seven. This was the first time Pakistan had enforced the follow-on in a Test in 16 years since they beat New Zealand by an innings and 324 runs at Lahore in 2002. Pakistan resumed on their overnight 268 for six.